I love blogging it makes me feel as if I get to go over to a good friends’ house and catch up on their lives without ever leaving my living room, city, state, or taking off my Pj’s! Today while “visiting” my friend Linda at teacher dance I discovered the blog teacher Authors on her blog roll. 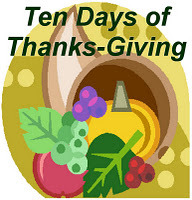 I skipped on over to check it out because I liked their title so well “ten days of Thanks-giving: Time to share your thank-yous” what I found was a challenge to blog about things and people you are thankful for, for the next ten days- November 20-November 30th. I love this idea. I haven’t been keeping up on my blogging lately. I have been out of my room for three weeks so that my sweet student teacher could have practice in “Teaching time” own her own. While it has been great having some extra time, it has left me a little uninspired in the blogging world-no cute/funny stories to pass on, and no wonderful teaching ideas to share because I have not been teaching. So my first thank you goes to Miss Lindsay, my ever so sweet student teacher whose time has gone too fast in our happy classroom. The rules say your thank you needs to be 25 words or less, so here goes and the first part of this post doesn’t count. Lol! Skip on over to the Teaching Authors and join in. You'll be Thankful you did! Hi Tammy. Thanks for the mention on your blog, but I must correct you to say my name is Linda, instead of Barbara. I'm glad you found the Teaching Authors blog; I've loved their posts & I hope you will too--lots of info & ideas for writing! Have a good time 'returning' to your classroom. lol I'm so sorry I knew that I must have had my teaching partner Barbara on my mind. I will fix it now! Sorry again! It's fine-I know that I make funny errors too, & I do still appreciate the thought, which is really what counts, right? Thank you too for the comment on my post. It's been a lovely day! Actually, I changed my commenting tag-so you did me a favor. I probably should have told my name a long time ago!